I got interested in the Charter Arms Bulldog in .44 special some while back when they started disappearing from the market place at l50-l65 bucks in blue finish. Did not get one then as the price was attracted to a lot of people and first money talked. 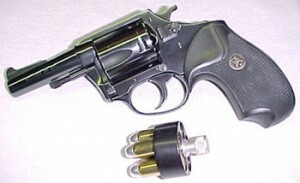 I did purchase a Charter Bulldog Pug in 2 1/2″ stainless finish with the chopped hammer with heavy front shroud. It came in a neat little triangular plastic case with a lock of sorts for the gun. Paid $250 that included Kentucky State tax at a gun show from a FFL that I have known for quite some time. Finally made it to the range to run the standard of two hundred rounds through it of different brands and loads. A minute ago, I was already at the range but I had to tell you about the gentle preparation to the piece that the factory should have taken care of before it left them. Set up targets at five yards away with 3/4″ orange dots for the Bulls eye to give me a competitive edge (it damn well helped me see the target). After I loaded up the first five rounds of 240 grain lead, hoisted the piece and set the sights on the target, I was anticipating the great pain that runs down my strong hand, through the arm and shoulder, and the jarring of the teeth that I get when I shoot my .44mag Ruger. Blast away, first two shots were in the orange and side by side. No pain, no tremendous jolt to this old body at all. And I pulled the only dumb trick that I ever pulled on a firing range. I turned that revolver around and looked down the barrel to see if I really had it stoked with .44 special and not some smaller mighty mouse. After I realized what I was doing by looking down the snoot, I beat myself up real bad for pulling that dumb trick. I know that all want to get to the end of this story. I put four boxes down that 2 1/2″ tube and it was a delight to do so. Shot 180 gr. up to 240 gr. I could ould tell the difference with the lighter load. One of the five yard targets, I held a close pattern of 3″ and better. When the targets moved to fifteen yards (I put them there, they did not have legs) it was another story. My targets were six inch pie plates, with the orange dot and I just held the hits on the plate with a few strays (poor bystander). The finish is of brushed stainless. I got a deal from a vender at the same gun show on a holster, Galco SW 1003 in black and it fits perfect for my CCDW carry. I am still looking for a pocket holster to fit the Bulldog though. Do I like it? Yes I do. Do I recommend it? Yes it do. There is omething about this piece. It hits hard, but does not have the recoil that I expected it to have. By the way I lent it to my friend who is a pawn shop owner. He took it home and shot it. Came back to the shop and ordered two of them the next day. Sold one when he got the two in. I am glad that the Charter Bulldog Pug is back on the street. Charco 2000, Inc., 273 Canal Street, Shelton Ct., 06484, no phone, no email.